Flashes of burnished copper reflect the warmth of a shimmering wedding day on a golden afternoon. This gloriously unstructured bouquet by Blossom Studio Minneapolis draws together texture, color and mood. 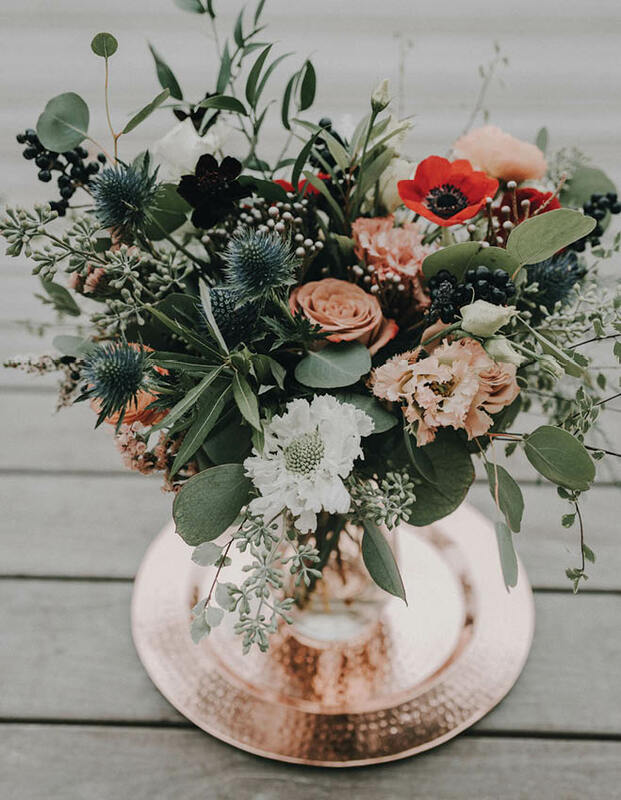 Soft shades of deep blue, sage, cream, burgundy and copper are reflected in Italian ruscus, ranunculus, seeded eucalyptus, pittosporum, cosmos, lisianthus, Quicksand garden roses and blue eryngium, with a bright accent of red poppy. 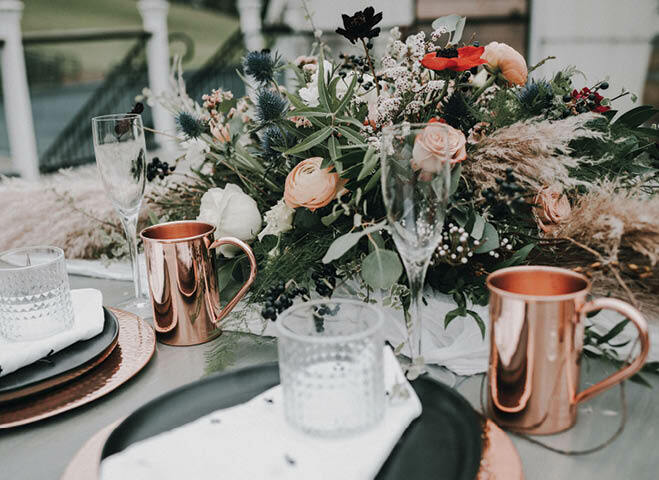 Set atop a hammered copper tray from Copper Mug Co., it’s all very boho chic—just right for a special day on the farm. 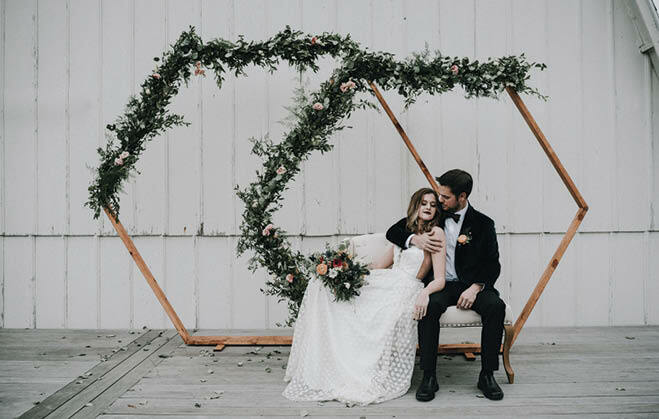 Less is more in this serene setting, where an angular arbor with floral swag frames the happy couple. 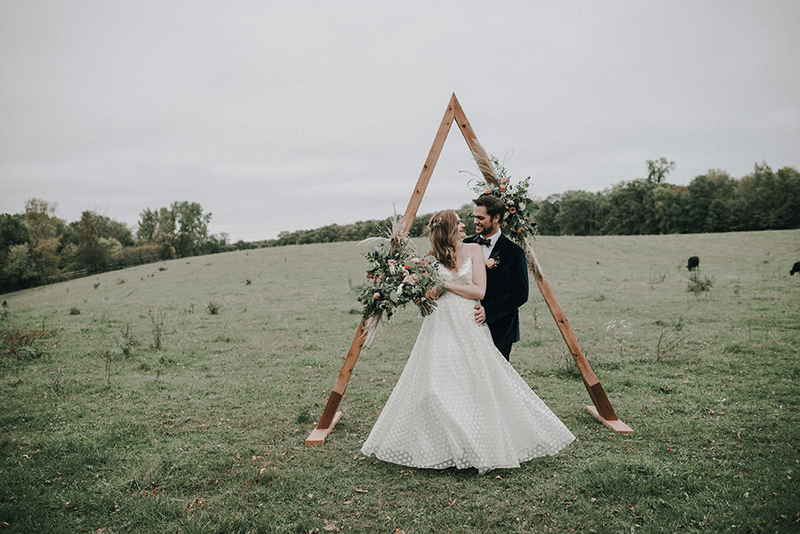 This wedding design—modern with a rustic touch—is beautifully masterminded by photographer Hannah Ampe with assistance from Santé Events & Rentals’ Amy House. The gown by Truvelle from a&bé bridal shop has easy elegance that fits the laid-back ambience. 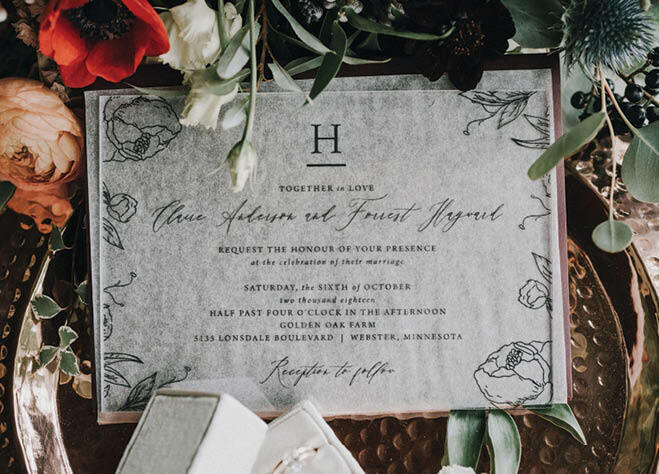 A touch of tradition makes an entrance in these invitations with striking black calligraphy and charming line drawings. The twist: They’re printed on a clear overlay backed with paper. The stationery suite, designed by PaperPlumCo., also includes burgundy envelopes. Peeking out from a specially designed case by The Mrs. Box, another important detail: the ring. Share the news with the world: It’s Mr. and Mrs., thank you very much. 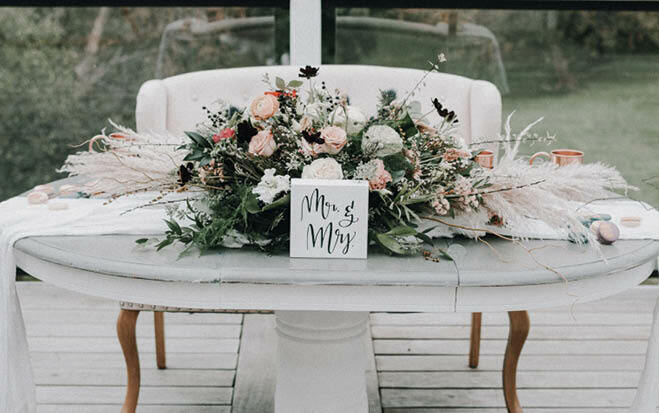 Display that new status with a tabletop announcement highlighted with a dramatic floral spray on vintage white furniture. 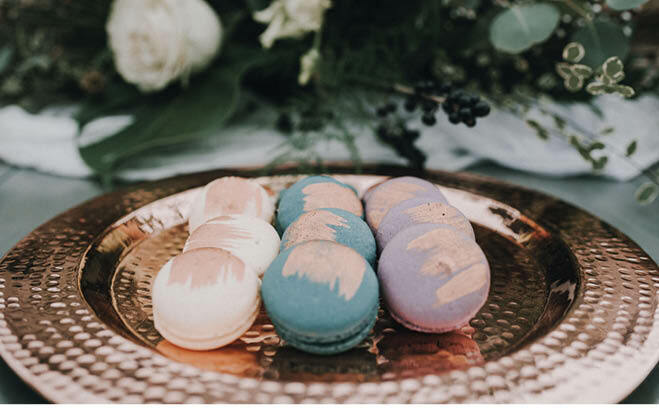 Sweet to eat and lovely to look at, these delicious macarons from Amy’s Cupcake Shoppe take on the colors of the day, set off by a copper platter. With flavors such as blueberry lemon, cherry vanilla and lavender honey, who wouldn’t ask for seconds? 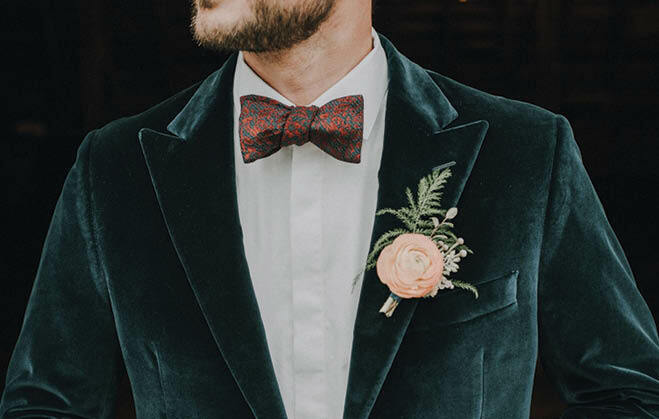 Contrast this deep blue velvet suit with a red-patterned bow-tie for effortless chic, both from MartinPatrick3. The contrasting boutonniere from Blossom Studio Minneapolis was created with ranunculus, fern, pittosporum and brunia. Stealing a quiet moment together is just the thing. Our couple relaxes on a vintage settee with wooden backdrops from Santé Events & Rentals, draped with a garland by Blossom Studio Minneapolis. Smooth, shiny and subtle: This tablescape has it all with the casual copper-cream tones of the relaxed florals and the wow-factor cups and chargers. Transparent champagne flutes and glasses cool it down for the perfect vibe. This styled shoot combines beautiful rich hues and bold textures to achieve maximum cozy fall vibes.